This article first appeared in The Edge Financial Daily, on December 6, 2017. It’s been 25 years since Lamborghini had an off-roader in its range, but while the LM 002 was built for the military, was powered by the same V12 engine that propelled the Countach, had an unquenchable thirst for fuel and only achieved a total sales number of 328 examples in its seven-year lifespan, the Urus promises to be something else altogether. “The Urus elevates the SUV to a level not previously possible, the Super SUV. It is a true Lamborghini in terms of design, performance, driving dynamics and emotion as well as drivable every day in a range of environments,” said Stefano Domenicali, Automobili Lamborghini chairman and chief executive officer. The demand for all things SUV shows no signs of abating and Lamborghini doesn’t simply want to break into this lucrative market at the very highest end — it wants to own it. It expects to sell thousands of Urus SUVs and a new purpose-built factory is waiting to meet predicted demand. It’s an expectation that Domenicali alluded to in his presentation. “[It] transcends the boundaries of expectations and opens the door to new possibilities, for both our brand and our customers,” he said. And if the car can live up to its looks and specifications in the real world, then there is absolutely nothing stopping the Urus from becoming Lamborghini’s greatest hit in terms of sales. Underpinned by the same platform used by Bentley’s equally outrageous Bentagya, the Urus also seats four in comfort but, thanks to a 4-litre twin-turbo V8 engine outputting a massive 650hp and 850Nm of torque, it can also catapult everyone on board from a standstill to 100kph in just 3.5 seconds. A very intelligent all-wheel drive system with torque vectoring to push power to the wheel that needs it the most — whether on tarmac, gravel sand or bouncing over rocks — promises to keep the car under control when the going gets tough, and, because it also comes with four-wheel steering as standard, it should be easy to manoeuvre in inner-city settings and shouldn’t get too tail happy if you’re taking it to the track. This is a Lamborghini after all and even if it’s one with high sides, four doors and luggage space, it also has a dedicated race mode. Then there are the looks. 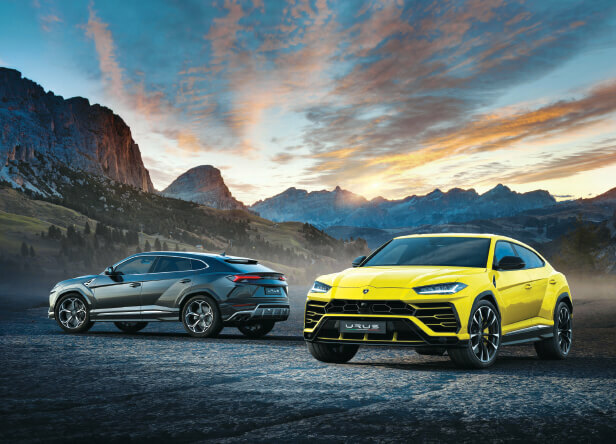 Lamborghini has managed to keep the Urus in the family without making the same styling mistakes Porsche made with the first-generation Cayenne, which tried too hard to resemble the 911. Instead, it has its own visual personality but Lamborghini obsessives will be able to spot a host of subtle aesthetic nods to Lambos past and present. It uses the same proportional approach (glass to metal ratio) as the Aventador and Huracán, but there are also references to the Countach, Miura and even the aforementioned LM 002.